Over the past decade, young people have been migrating to Hoboken because of its proximity to New York City, thrilling nightlife, and incredible waterfront views. Hoboken Wedding Photography often takes full advantage of the waterfront scenery, especially the views of the Manhattan skyline. This picture shows off a view such as that, with the bride and groom together on the edge of Hoboken’s Pier C. The couple stands before the waters of the Hudson River in all of their wedding finery. The groom has donned a classic black tuxedo and bow tie, while the bride wears what a first appears to be a simple white, satin, strapless gown. It’s the little details that make this dress truly special for the bride. Down the back of the gown tiny satin buttons run all the way to the ground and, if one looks closely, discrete pockets can be see at the bride’s hips making the dress both beautiful and functional. It is a dress that is elegant, but also shows a hint of the bride’s personality. The bride wraps her arms around the groom’s waist as she tilts her head up for a kiss. It is a tender moment between the husband and wife to be, shared before an extensive backdrop of the city that never sleeps. 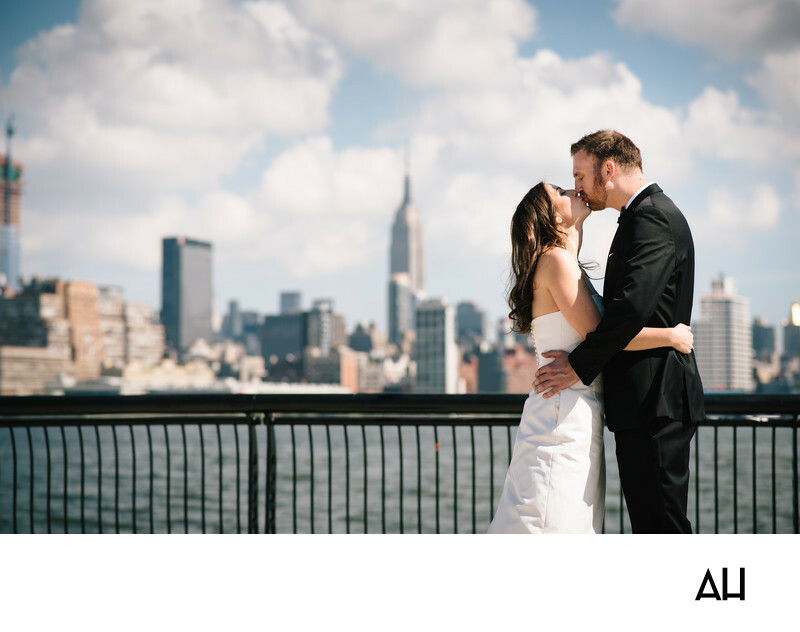 The city skyline spreads out behind the couple, with the Empire State Building at the center. It is an epic setting for the bride and groom to pose before and for gorgeous Hoboken Wedding Photography.